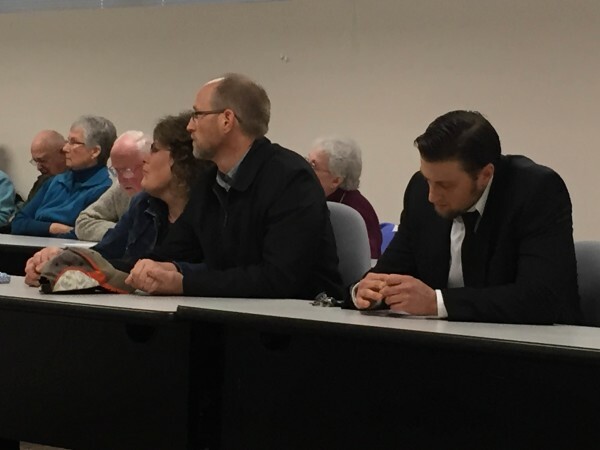 Nathan Beck (right) and his father, Dan Beck (center), listen during a recent Maine Human Rights Commission hearing regarding allegations that Moody's Diner, which is co-owned by Beck, discriminated against a longtime employee. AUGUSTA, Maine — Gov. Paul LePage inserted himself into a state law enforcement proceeding about a religious discrimination case and threatened to go to court if the legal process was not postponed, according to an internal memo. The governor, however, said he was not interfering, but only trying to make sure there was no “ethical breach” in the case involving an audio recording he had been told was edited. A request for postponement of the Moody’s Diner case was denied by the executive director of the Maine Human Rights Commission. LePage said that prompted him to direct an attorney in his office to investigate the case, and he’s also going to appoint a task force by executive order to review the Maine Human Rights Commission’s operation. The memo from the executive director of the Human Rights Commission, Amy Sneirson, states she received a phone call from the governor just hours before the parties in the case were to meet with the commission to try to settle the case out of court. The commission is the state agency charged with enforcing Maine’s anti-discrimination laws. The commission earlier had ruled there were “reasonable grounds” to show that the diner and its co-owner, a devout Presbyterian, had discriminated and retaliated against a waitress because, for example, the co-owner said she was “not following Jesus” while dating his son. The Feb. 6 conciliation hearing was unsuccessful and the commission now will decide whether it will file a civil suit against Moody’s, the landmark Waldoboro diner founded in 1927. The Sneirson memo was obtained through a Maine Freedom of Access Act request. He said they had raised doubts in his mind about whether the commission’s investigating officer was biased. LePage asked Sneirson to postpone the conciliation meeting scheduled for later that day “so he could issue an executive order to investigate” if there had been “improper action” by the commission’s investigator. “If we don’t cooperate, the governor will go to court,” Sneirson states in the memo. Later that day, Herman told Sneirson she had spoken to the governor’s staff attorney, Cynthia Montgomery, who told her the governor would not pursue an executive action but asked Montgomery to review the case herself. Montgomery asked Sneirson to postpone the conciliation session so that she could review the case, but Sneirson told her she was “not inclined to postpone” and, in fact, did not. A week after the call from the governor, the commission sent his office what Sneirson called a routine request to approve funds for the agency, about $4,000 to be used to fill a temporary position. She said she was informed the next Monday by the governor’s office that he was not going to sign the request but gave no reason. Sneirson said she cannot recall in her nearly three years at the commission any such financial requests being denied. LePage, in an interview in his office on Tuesday, said the representatives he met with from the diner told him the commission’s investigator edited a tape recording made by the waitress. LePage said the commissioners got only a “sound bite,” not the whole tape. “I said, ‘That sounds strange to me,’ so I called over there,” LePage said. He denied he was trying to interfere in an agency case that has already been ruled on. “The people of Maine are my job, and if somebody is trying to do something behind the scenes and sneaky, I would try to look into it,” he said. The Moody’s case began in January 2014 when the waitress, Allina Diaz, filed a complaint with the Human Rights Commission. Commission investigator Michele Dion’s subsequent 14-page report details Diaz’s accusations and the responses of Moody’s co-owner Dan Beck. The case revolved mostly around Beck, a devout Presbyterian who was upset that his son was dating and living with Diaz, who was not religious. Beck told the investigator that if Diaz “had not been in a romantic relationship with son, there would be no issue” and that he “took no action” against Diaz on a religious basis. After a public hearing last November, the commission ruled there were “reasonable grounds” to find against the owners of the diner. The five-member commission — including three appointed by LePage — voted unanimously to find that Beck and the restaurant had created a “hostile work environment” based on religion, had discriminated against Diaz on a religious basis and had retaliated against her through working conditions because she had filed a complaint with the commission. The Moody’s incident is reminiscent of LePage involving himself in another agency that handles employer-employee disputes. In 2013, the Sun Journal reported that at a meeting with state Department of Labor hearing officers LePage said employers were not getting a fair shake and the hearing officers were ruling too often for employees. A subsequent U.S. Department of Labor examination found officials in LePage’s administration may have inappropriately used their positions to influence the unemployment claims appeals process, according to the Sun Journal.